David cameron visited Brigshaw High School. 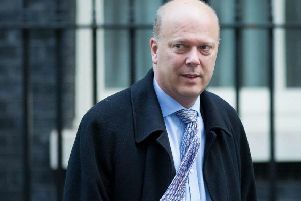 Flagship high speed rail projects designed to connect the North of England may not be completed if Britain leaves the EU, David Cameron has warned. Delivering the multi-billion pound HS2 and HS3 schemes are at the forefront of the Conservative party’s vision to create a Northern Powerhouse. However a vote to abandon the EU on June 23 could signal the end of proposed levels of investment in rail, Mr Cameron suggested, as grappling with a £40m blackhole in their finances and public spending commitments would have to be managed within a smaller economy. Speaking exclusively to readers of the Yorkshire Post in central Leeds yesterday, the Prime Minister said: “If we stay in [the EU] all our plans are fully intact and that includes HS2, and what we have said about HS3, and the overall rail investment programme. As recently as March, Chancellor George Osborne announced a £60m fund to kick-start a speedier route between Manchester and Leeds that would slash journey times by 30 minutes, while HS2’s budget is currently £55.7bn. Earlier in the day Mr Cameron paid a visit to a farm in Thirsk and then took questions from readers at the Yorkshire Post for almost an hour. A smaller economy would naturally put the brakes on public spending, he told Andrew Latchmore, a partner in Leeds based corporate law firm Shulmans, who had asked him if he would prioritize investment in HS2 and HS3 if Britain leaves the EU. Mr Cameron made a plea to readers to think “logically” about the consequences of lower tax revenues - which he believes will be the likely economic scenario if Britain votes to leave the EU as commercial services would abandon the UK. Pupils from Brigshaw High School in Kippax near Castleford also had a chance to visit the Prime Minister on Thursday.